Two in three nurses said in a survey last year that they had too little time to provide high quality care to dying patients. Now the Nursing Standard and Marie Curie are holding a second survey of nurses and healthcare assistants (HCAs). 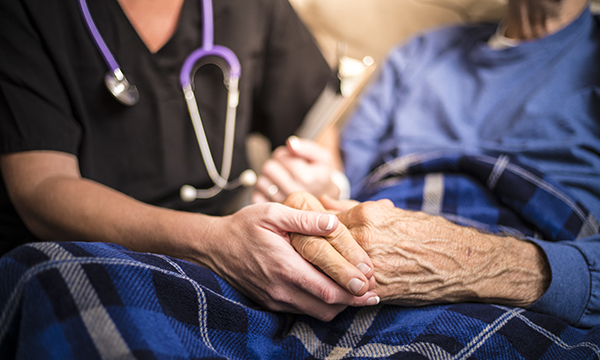 The poll aims to find out the experiences of nurses and HCAs in caring for people in their final days and how or if this has changed since the first survey a year ago. The first survey found that four in ten of the almost 1,000 respondents had received no training in end of life care. Has the situation improved, stayed the same or worsened? Other barriers to providing care to dying patients identified by the respondents included staffing levels (68%), lack of specialist palliative care support (33%) and lack of community service provision (33%). Most nurses were aware of dying patients remaining in hospital unnecessarily because of delays in funding and provision that would have allowed them to be cared for in the community. Launching the 2018 survey, Nursing Standard editor Graham Scott said: ‘Nurses told us in 2017 that they were under immense strain and the service was reaching breaking point. Marie Curie director of nursing Dee Sissons said: ‘Sadly, last year we found that many respondents felt frustrated by a lack of time and resources – and other barriers – that prevented them from providing patients and their families with the best possible care. The 2018 survey closes at 9am on 5 February. Everyone who completes the survey can opt to be entered into a prize draw to win one of ten £50 M&S vouchers.